​Download a poster here to share online or here for a printable copy. An online reservation is required prior to coming to the event. Your reservation time is for your start time, not your pony ride time and not your arrival time. Pony rides happen later, after you have traveled to the barn. Please ensure everyone in your group is on time, or they may not be able to travel together. Those on time will need to start on time, and others, if we are able to accommodate them in their lateness, will have to meet up with you later (e.g. in the barn). 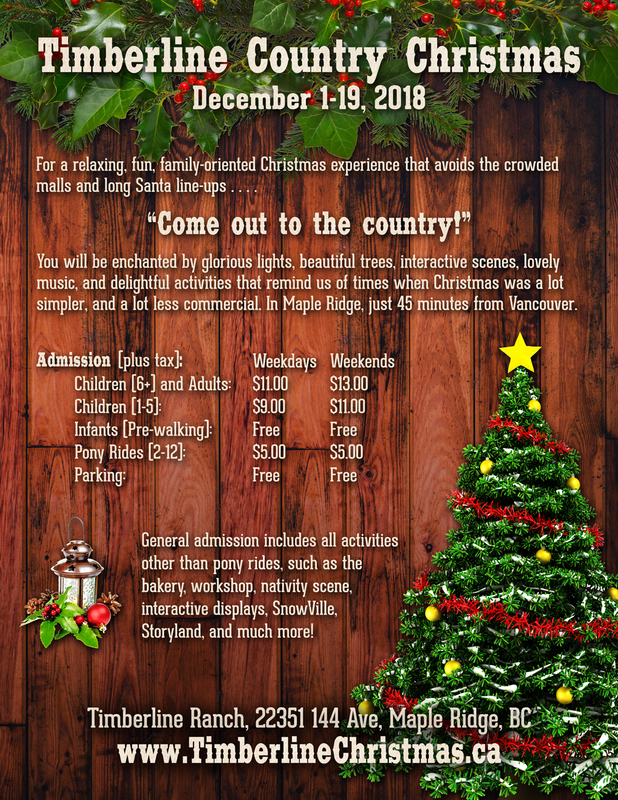 You will be inside most of the time, but please dress for the weather as there are some outdoor aspects, such as walking from the parking lot and going short distances between buildings and the wagon rides. This is a "linear" event, in that you will progress from activity to activity, at your own pace, ending up back where you started. We ask that people do not try to "go back for a second time." Most people will take about 90 minutes to two hours to enjoy all of the activities. The activities are aimed primarily at children, but adults certainly seem to enjoy them, too, especially with their children. This is not a highly-polished event with 10 million lights on display! It is simple and fun. Kids find it amazing. Adults enjoy the peacefulness of the country and the relaxed, no-rush atmosphere. There is no Santa at this event, as it is intended to be more traditional and relaxing. Vote for your favorite tree that has been decorated by a local business. Interact physically with numerous small displays that explain where many of our Christmas traditions come from, such as Mistletoe, Christmas Trees, Santa Claus, and Christmas Stockings. Decorate a large, delicious cookie, and then, of course, eat it! 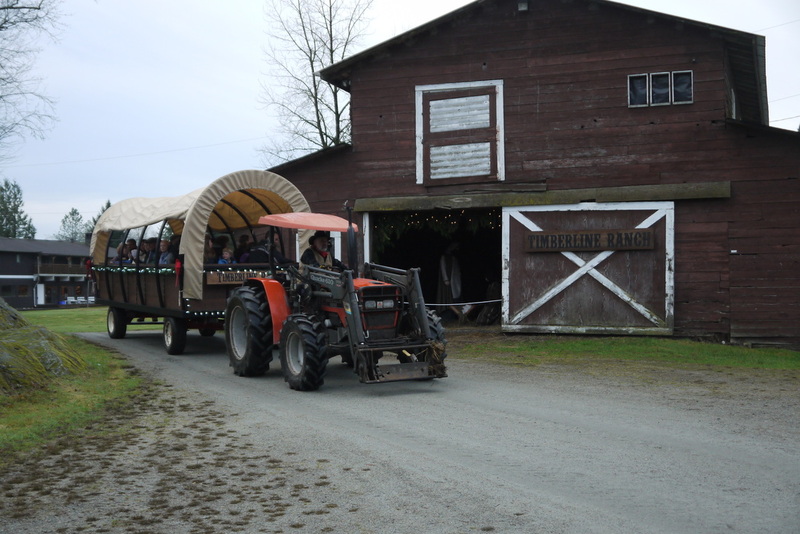 Climb aboard for a ten minute ride around the Ranch and off and on at the Barn. Please Note: This will, unfortunately, not run if Timberline's roads are snowy or icy. Find your way through this indoor maze to find the three hidden treasures. Interact first-hand with a whole bunch of friendly animals, including a llama, donkey, miniature horse, bunnies, goats, and more! See Mary, Joseph, Baby Jesus, and the Shepherds at the manger. Test your skills in a snow-themed ball pit with snowman targets and fun games. Bring your camera and we’ll take your photos in a booth set up to give you that country Christmas look and feeling. Make a unique Christmas ornament that you can take home with you. Enjoy fun activities and puzzles. Hear and see a story come to life about a Christmas long ago. Will Sparky the Raccoon be back to help tell the story? Pre-book these rides for only $5.00 (+GST) per child 12 and under.